Conversations, the universal inbox that includes live chat, team email, and an easy-to-use chatbot builder, is now live to all HubSpot users. The way that we communicate with one another has changed. Kick off a conversation over live chat, follow up with an email, and maybe even a phone call. These conversations are fluid, taking place across different channels and platforms and teams. For businesses, it’s been tough to keep up. Siloed tools and siloed teams often lead to siloed conversations and poor customer experiences… until today. 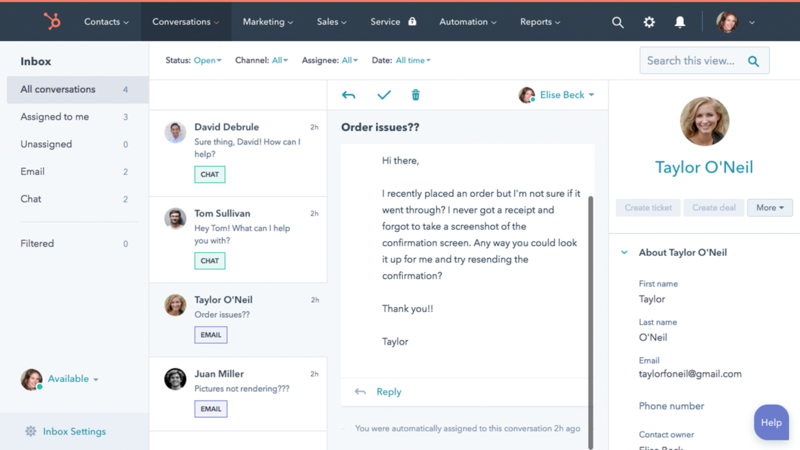 With Conversations, HubSpot’s newest feature, you can kick off a conversation over live chat, follow up with an email, and loop in other members of your team -- all without missing a beat. Universal Inbox - Get a birds-eye view of all your 1:1 interactions -- from live chat messages to emails and beyond. Live Chat - Start building better relationships by easily adding live chat to your website. Chatbot Builder - Build and deploy chatbots to help you qualify leads, book meetings, or quickly provide solutions to common support issues. Conversations is a free feature. It's included in HubSpot CRM, and it’s here starting today!